Hold on tight and head up the Huon River for the ride of a lifetime. Feel the adrenalin surge as the jet boat accelerates to speeds of up to 80 kph. You'll whip along the riverbank, weaving in and out of the forest canopy that overhangs the river, bounce through white water and fly into full 360° spins. Enjoy true tranquility as you cruise through wide expanses of deep water surrounded by forest, wildlife and mountains in the distance. Gaze into the still waters that show off fabulous reflections of the river and skies. Get close up with Huon pines. 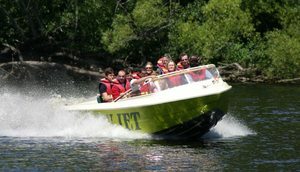 It's the balance between thrills and beauty that sets the Huon Jet apart from other jet boat rides.